Tweetbot 5 for iOS is out with a new look that more closely resembles the latest Mac version, which was redesigned in May. 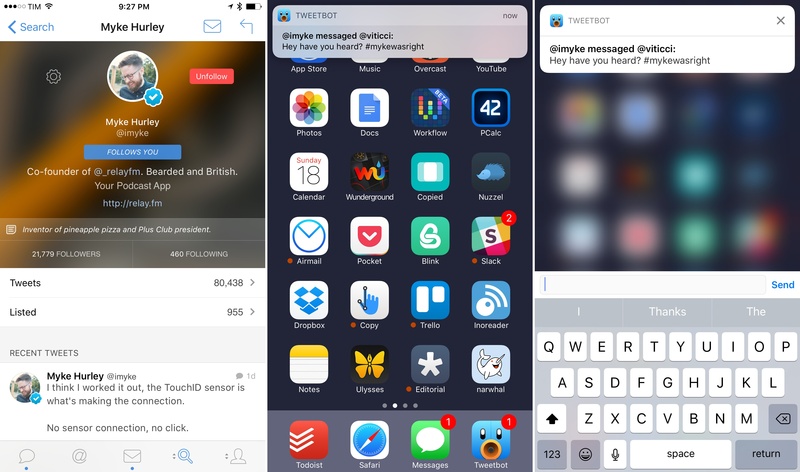 Tapbots has also added a handful of additional features, some of which mirror additions to the Mac version and others of which are unique to iOS. In April, Twitter delayed a transition to a new API that was expected to have a significant impact on third-party Twitter clients like Twitterrific and Tweetbot. The delay came in the wake of an outcry from users of third-party Twitter clients prompted by developers who banded together to encourage users to complain to Twitter about the API changes that were set to take effect on June 19, 2018. Today, Twitter announced that those changes would go forward on August 16, 2018 – about two months later than originally planned. “Twitter has a replacement API that – if we’re given access to – we’ll be able to use to replace almost all of the functionality that they are deprecating,” he explains. “On Mac, the worst case scenario is that we won’t be able to show notifications for Likes and Retweets. Notifications for Tweets, Mentions, Quotes, DMs and Follows will be delayed one to two minutes,” Haddad adds. In addition to announcing transition date, Twitter announced pricing for its new API, and it’s expensive. A subscription covering 100-250 users will cost $2899/month, which works out to over $11 per user for 250 users. Anyone with over 250 users, which would include all the major third-party Twitter clients, is advised to contact Twitter for enterprise pricing. However, the pricing on the API's lower tiers doesn’t leave much room for optimism. Third-party clients that can’t or don’t want to pay those prices will have to make do without timeline streaming and push notifications for likes and retweets. Other notifications will be delayed approximately 1-2 minutes according to statements by Haddad to TechCrunch. A lot of functionality that users of third-party apps took for granted is going away. That was the motivation for the apps-of-a-feather.com website - to soften the blow of this announcement. Hockenberry elaborated that The Iconfactory has reached out to Twitter regarding enterprise pricing for the new APIs, but says that he doesn’t anticipate the pricing will be affordable absent a significant discount. Long term, I don’t think there will be any apps other than the official one. I also don’t think Twitter realizes that many long-time users, who are highly engaged on the service, are also the people who use third-party apps. These folks will look elsewhere for their social media needs. Given Twitter’s repeated hostility towards third-party clients, that’s a hard sentiment to argue against and one that gets my attention more than Twitter’s announcement. I can live with the latest changes to Twitter’s API, but if third-party developers conclude that their time and resources are better spent elsewhere, I expect the end of the Twitter I know and use today is closer than I thought. 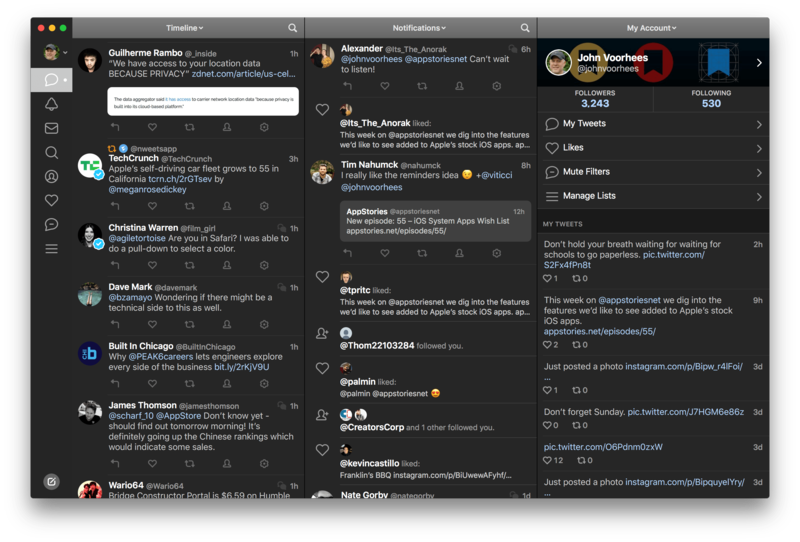 Tapbots has released Tweetbot 3 for Mac, which overhauls the app’s design, provides greater flexibility to manage multiple columns and navigate different parts of Twitter, and includes a dark mode. For the first time since it was introduced in 2012, Tapbots has also made version 3.0 a separate paid app, which means that existing and new users alike will have to pay $9.99 for the update. Yesterday, Twitter extended the character limit of tweets to 280. Unlike some features, Twitter has made the new tweet length available to all third-party developers. First out of the gate is Tweetbot by Tapbots. 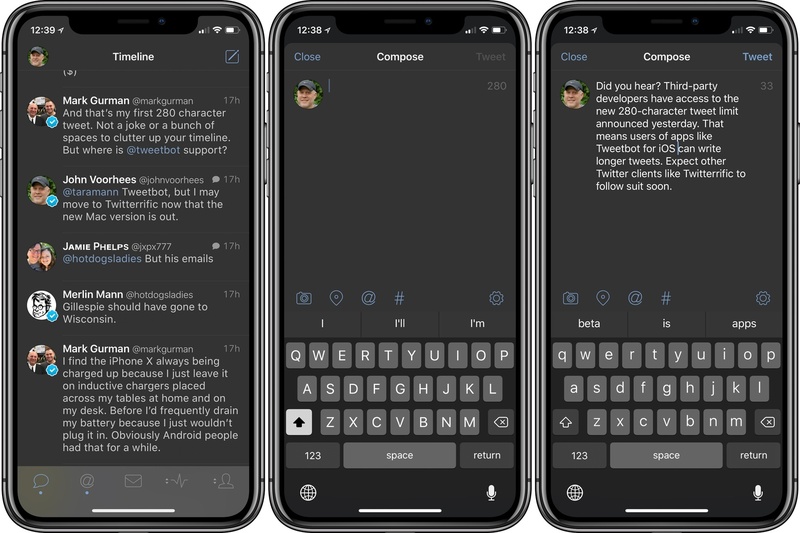 Less than 24 hours after Twitter’s announcement, Tweetbot users can use a full 280 characters in tweets. I expect we’ll see additional updates from other Twitter client developers soon. 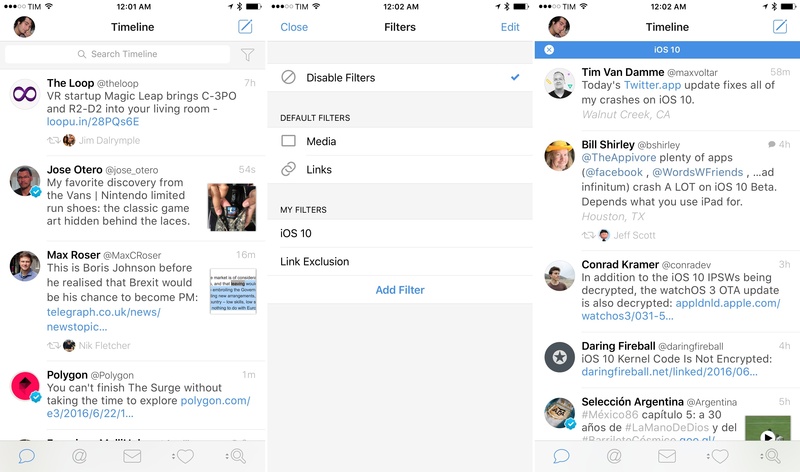 Tweetbot is available on the App Store. 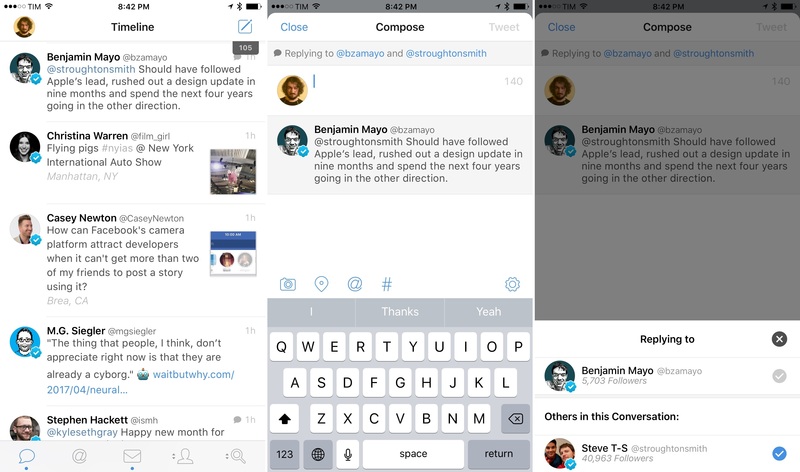 The new compose UI for replies in Tweetbot 4.6. In an update released today on the App Store, Tapbots has started taking advantage of Twitter's more flexible third-party API to allow users to send images in private conversations (DMs). The feature – which has long been available in Twitter's official app – is limited to static images for now (no videos or animated GIFs), although the Twitter API could make more attachment types possible in the future. Perhaps more notably, Tweetbot 4.6 comes with a redesigned compose interface for replies. Similarly to Twitter's iPhone app, Tweetbot 4.6 doesn't count usernames against the 140-character limit. To present this change in functionality, Tapbots has opted for a Twitter-like design where usernames aren't displayed in the compose box upon starting a reply. Instead, a "Replying to..." banner at the top of the screen highlights the tweet's original author and other participants in a conversation. Tap the banner, and, like in the Twitter app, you'll be a shown a popup with a list of users you're replying to. The author at the top of the list can't be de-selected; other users in the conversation can be removed by tapping on the blue checkmarks. Twitter (left) and Tweetbot 4.6. While this design is similar to Twitter's, it should be noted that Tweetbot limits this presentation to the compose view for replies. Unlike Twitter's official apps, usernames are still displayed in the body of a tweet in both the Timeline and Mentions views, providing a familiar format that doesn't force you to tap on the "Replying to..." banner from every section of the app. Personally, I believe Tapbots adopted a better solution than Twitter itself: the compose UI is nicer and usernames are easier to remove, but the timeline retains the familiar @usernames that add context to inline conversations. I'm curious to see how Twitter's new API roadmap will impact third-party clients such as Tweetbot over the next few months. Tweetbot continues to be my daily Twitter client on every platform, and I hope Tapbots will be able to add even more native Twitter features in future updates (I'd love to have support for polls in Tweetbot). Tweetbot 4.6 is available on the App Store. When Twitter rolled out support for longer tweets yesterday, we mentioned that Tweetbot – the popular third-party client – would soon support the new format natively. Tapbots has released updates to the iOS and macOS apps today that let you view and create longer tweets (where media, polls, and quotes don't count against 140 characters) without having to rely on Twitter's official app. You can get the iOS update here. Profile notes and slightly richer notifications in Tweetbot 4.5. 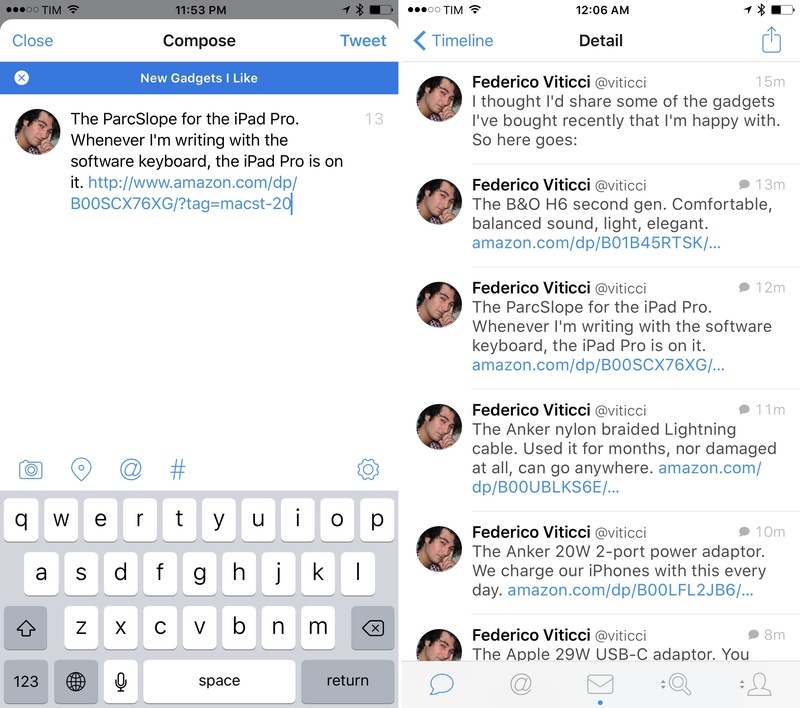 Tapbots released Tweetbot 4.5 today with a few iOS 10 additions. In the latest version, notifications are slightly richer: you won't be able to preview entire conversation or DM threads in a notification, but at least the sender's username and notification title will have a bold font for better visual separation. I would have liked to see even richer notifications with custom interfaces, and I also wonder if Tweetbot could use SiriKit's messaging intents to send DMs. Perhaps Tapbots will consider deeper iOS 10 enhancements in the future. Also new in this version, you can now add notes to user profiles. According to Tapbots, the feature is intended to add a brief note to remember why you followed someone; personally, I think it's just as effective to remember why you don't want to follow someone without blocking them. User notes are private, they sync with iCloud, and they can be accessed from the gear menu on a user's profile. Finally, Tweetbot 4.5 supports smoother scrolling thanks to iOS 10's performance improvements in this area. It's not always noticeable, but I'm glad Tapbots implemented this feature for iOS 10 devices. Tweetbot 4.5 is available on the App Store. 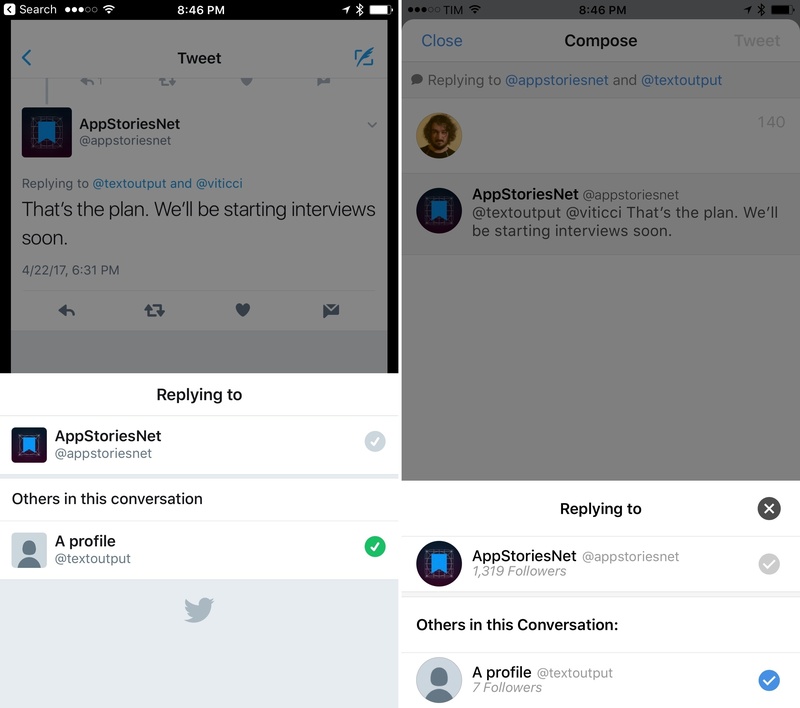 With an update launching today on the App Store, Tweetbot is adding the ability to filter timelines – any timeline within the app – by specific types of content. A topic in the new Tweetbot 4.3. Picture this: it's WWDC keynote day and you're following the event. You want to live tweet as the event unfolds. What do you do? The answer is that, so far, Twitter the company has mostly failed to provide users with ways to rapidly tweet commentary and have tweets intelligently grouped together once an event is over. Sure, you could append the same hashtag to every tweet, "tagging it" for context, but that wouldn't fix the underlying problem of a bunch of messages related to the same event and yet treated as atomic units with no relationship between them. Thus Twitter the community came up with the idea of the tweetstorm, a clever workaround based on how Twitter threads work. If you want to post multiple tweets in a row and establish a thread between them from start to finish, reply to your own tweet, removing your username at the beginning of the message, and you'll "fake" a series of topical tweets which Twitter sees as part of a conversation...with yourself. It's not the most elegant solution, and it doesn't work well for rapid fire live tweeting, but it sort of works and a lot of people use it by now. 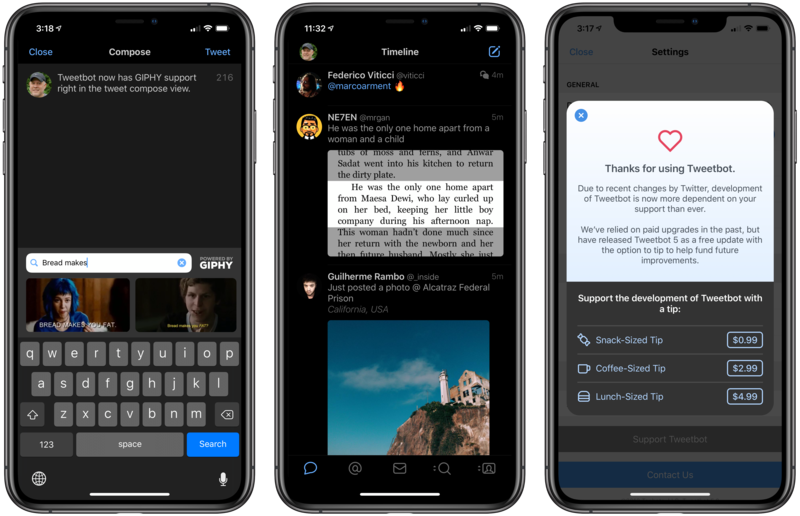 Tweetbot, the excellent Twitter client developed by Tapbots which relaunched with version 4.0 in October, is introducing an update today that fully embraces the concept of tweetstorms with a feature called "topics". Topics simplify the process of chaining tweets together with an intuitive interface that makes it look like Twitter rolled out support for topics. Under the hood, Tapbots is still leveraging the aforementioned @reply workaround, but they've been clever enough to completely abstract that from the UI, building what is, quite possibly, one of the most ingenious Tweetbot features to date.